The Belkin N450 DB Wi-Fi Dual-Band Router provides high-speed Internet connections for video streaming and music downloads. Connect to the Internet with multiple devices throughout your home at speeds of up to 150Mbps + 300Mbps* -- all at the same time. Dual Band technology offers two separate frequency bands to enjoy different online activities with multiple devices – all without interrupting or slowing down your connection. So now the entire household can stream video, send emails, or download music simultaneously. Belkin's Simple Start browser-based setup interface makes installation easy and eliminates the need for fumbling with installation CDs. Use your tablet, smartphone, or computer--whichever you prefer--to set up your router in minutes. Exclusive MultiBeam technology offers powerful signal strength for maximum coverage and reliability – connect from virtually anywhere in your home with fewer deadspots. You won't even have to hassle with security settings. 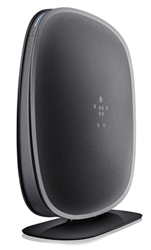 The N450 come with preconfigured Wi-Fi encryption to get you up and running quickly and safely. Parental Controls protects the entire network by blocking unwanted content to all your devices automatically. *The standard transmission rates—150Mbps (for 2.4GHz), 300Mbps (for 5GHz), 54Mbps, and 11Mbps—are the physical data rates. Actual data throughput will be lower and may depend on the mix of wireless products used. In order to achieve the best performance, router must be used with a compatible wireless device. Achieve speeds up to 150Mbps+300Mbps * with multiple devices. Simultaneous dual-band operating on 2.4 and 5 GHz bands. Browser-based window uses your smartphone, tablet or computer to install your router in just minutes. Block unwanted content to all your devices automatically. Powerful signal strength for maximum coverage with fewer dead spots.